Gish Game Review - Download and Play Free Version! Unique theme for a side scrolling adventure game. Tons of game content to keep you busy. Several multiplayer modes so you and a friend can compete. Secrets and secret levels give you a reason to replay the game. Accurately controlling Gish can be difficult. This Ball of Tar Will Do Anything to Save His Girlfriend! Gish isn't your average hero. In fact, he's a ball of tar. But when his girlfriend Brea is kidnapped by a shadowy figure that climbed out of a manhole, Gish will do anything to save her! Gish follows Brea's frantic calls for help into the sewers of Dross, a forgotten city filled with twisting corridors, evil traps and demented creatures. With his gooey structure as his only defense, Gish must defeat the freakish creatures, discover the identity of Brea's captor and save the day in this entertaining platformer. Gish presents a traditional platformer in which you'll run, jump, swim and use your changeable shape to get through a series of increasingly more complex environments while conking enemies on the head. There are times to beat, coins to collect, extra lives to earn and secrets to unlock, including extra levels that act as amusing tributes to classics like Super Mario Bros. and Pitfall. What makes Gish unique is how you can use him to strategically interact with the environment. Since you are a gelatinous blob of tar you can glide across the ground, make yourself slippery so you can flow through small spaces, become sticky to climb along walls, or become rigid to give yourself more weight. You're also equipped with some small hooks that let you scale walls and grip or move objects. With 34 story mode levels including five boss battles and 23 "collection" levels where you must grab as many coins as you can within a given time limit, you can enjoy hours of fascinating gameplay. 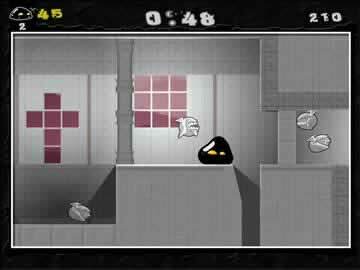 Take full advantage of the complex physics engine as you navigate tricky seesaws, pendulums and cinder blocks that you can fling into the air with your spikes. You can also test your platforming skills against a friend in 28 different versus levels with modes ranging from tar blob racing, moving a football across a field and a logrolling variation where each player attempts to maneuver the other off of a seesaw-like platform. If you are a fan of 2D side-scrolling platformers, download Gish and start the adventure today! Gish is not your standard side scrolling adventure game, it has a unique them and brings plenty of new elements to the standard gameplay. The persistent ball of tar (Gish) will have to navigate level after level and fight bosses to rescue his human girlfriend. This dark game is full of great music and plenty of unique characters to have you hooked from the start. The story you follow involves you, Gish (a ball of tar), and your human girlfriend who has been kidnapped and taken into the sewers. You will have to navigate a variety of different obstacles in 34 different levels. 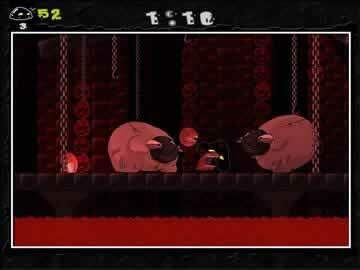 There is also a large variety of enemies to fight including bosses. Along the way you will be able to collect Ambers of varying size, which will add to your score. To find all of the Ambers in a given level you will have to find secret areas, sometimes these are beyond false walls or behind walls that you can destroy. There are 55 secrets to find as well as secret bonus levels. At the end of the game there are two possible endings depending on your performance in the last level. The controls for navigating levels are simple, but navigating the levels is where the difficulty comes in. The arrow keys control your direction, A brings out your hooks that allow you to scale walls and ceilings, S makes you slippery to slide through small areas, space bar is for jumping and D makes you heavy to smash things. Timing and control are very important because you will have to cross seesaw style bridges, hanging platforms and crumbling walkways. You will also need to master a host of other skills like picking up objects and flinging them. There are four modes of play: the campaign, Time Trial Collection, Play Room and multiplayer. Time Trial Collection mode lets you gather coins as quickly as you can, you must gather all the coins before a timer runs out or you fail. Play Room is this game's free play mode with no timers, no collection and no goals. Multiplayer offers six ways for you and your friends to compete. A couple examples are Sumo, Football and Pit Fight. In Sumo your goal is to knock the opponent off of a platform that works like a seesaw only it rotates 360 degrees. Football lets you test your skills against another by pushing or flinging a football off the opponent's side of the screen. Pit Fight is in a room surrounded by spikes and you must eliminate the other player. The graphics in Gish are 2D and similar to newer side scrolling adventure games. The game art is very unique and features creatures that look like they are sewn together. The music is very well done and adds a creepy feel to the game. All the levels have suitable mood music. Overall the sound and graphics are very well done and add that much more to the game. One of the only issues this game has is with controlling Gish. It can be very difficult to control the movement of Gish when you are trying to accurately climb. It also can be a little unpredictable. Sometimes you will be able to perform a certain action then for no apparent reason the next time you wont be able to. This can be frustrating when you are trying to navigate particularly hard obstacles. Both of this issues can be overcome with practice and patience so they don't detract too much from the game. Overall, Gish does a great job of bringing unique features to an often overused genre. 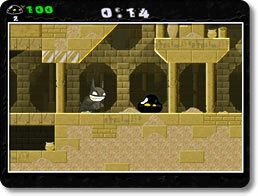 Using a tar ball as the main character and the dark music and levels make this more of a game for older users. Simple controls are easy to use, but mastering the game will take some time. With plenty of levels and hidden content you won't soon run out of things to do. If you like side scrolling adventure or are just interested in it, this is definitely worth the download. Watch some of the blobbing action that is Gish!